Zombie Joe’s Underground Theatre Group presents Josh T. Ryan and Zombie Joe’s wet n’ wild, high-euro-fashion adaptation of Shakespeare’s tale of love, murder and betrayal, where glamour is a rocky road and jealousy is a green-eyed monster. 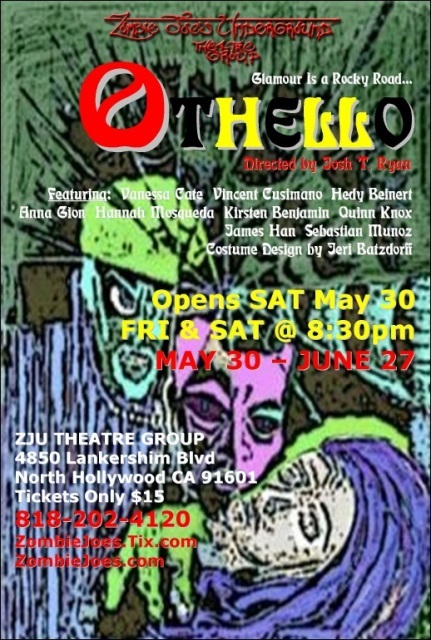 Directed by Josh T. Ryan, Othello headlines Zombie Joe’s 1st Annual Underground Fringe and will open Saturday, May 30th at 8:30 pm, running Fridays and Saturdays through June 27. Thank you we saw Blood Of Macbeth, and now just saw opening night of Othello. We are so impressed with this companies ability to have a fresh take on a classic, one that kept us engaged and delighted. This duo has managed to still tell the story but in such an innovative and bizarre way. What a fresh take on Shakespeare, one where we think the Bard himself would be overly amused. Go see it! Thanks Shakespeare in LA. To really get a new experience, don’t miss this Othello. Mashup director of Blood of Macbeth, Josh T. Ryan, does it again, and this time it’s the 70s all over again! Bravo!